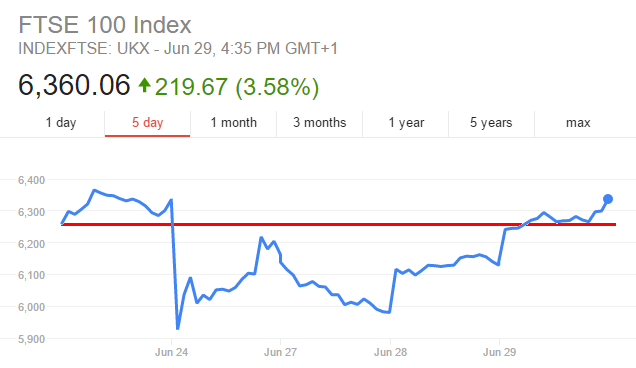 The FTSE 100 share index returned back to it's pre-referendum level yesterday, causing panic amongst Remain campaigners desperate for support for their campaign to overturn the result of the referendum. Stock market jitters were expected in the aftermath of the referendum because investors don't like uncertainty. Who the Tories choose as their new leader and who replaces George Osborne when he's sacked as Chancellor will also have an impact on the stock market but the decline was lower than expected and for a shorter period of time than expected. The big losers since the referendum have been International Airways Group (the owner of British Airways), Persimmon and Taylor Wimpey. However, analysts at Barclays warned at the start of June that IAG shares were overpriced and their outlook was uncertain because of competition from the US, stagnant economic growth in Europe and the US and terrorist attacks driving down demand. Analysts have also been divided on Persimmon and Taylor Wimpey but several have been warning that they are vastly overpriced.